Derek McInnes named a strong starting eleven for the Gayfield meeting with Falkirk, Stevie May and Sam Cosgrove having recovered from the knocks which kept them out of the match against Cobh Ramblers in Ireland. Paul Hartley fielded no fewer than nine new faces after a busy summer of recruitment. After a very cagey opening, Gary Mackay-Steven was the first to have an effort on goal, but his twenty-yard effort was comfortably saved by Fasan. The ring-rustiness associated with the early days of a new season was apparent as both sides tried to work their way into the game. On twenty minutes a header from Considine was deflected just over as the Dons began to exert their authority. Joe Lewis was called into action on 29 minutes when Turner moved down the left before cutting in and unleashing a fine right-footed shot which the keeper, at full stretch, turned behind. With ten minutes of the half left, a fine run by Cosgrove created an opening for Niall McGinn but the Irishman dragged his shot wide of the target. Stevie May was next to try his luck but again his long-range effort flew harmlessly wide. Paul Paton found his way into the ref’s black book in the 41st minute as his foul halted a driving run by Mackay-Steven but May’s free-kick was easy for Fasan to save. An uneventful first 45 ended with the sides struggling to find any real cutting edge in the final third. Chris Forrester came on for Stevie May at the interval while Falkirk made a raft of changes. The Irishman was quickly into his stride displaying an impressive array of passes as the Dons tried to breach the Bairns rearguard. Just after the hour mark, Falkirk took off Turner and Petravicius bringing on O’Hara and their second trialist. A good run from Robson saw him slip past Logan but Lewis was quickly off his line to smother the danger. A fine ball from Forrester almost played Cosgrove in but the big striker’s touch let him down at the vital moment. If the crowd of 922 was going to see a goal they were going to have to wait until the final quarter. On 70 minutes Lewis Ferguson and Frank Ross took over from McGinn and Gleeson in the Dons ranks. Two minutes later Paton was replaced by another trialist as the Bairns made their final switch. With 13 minutes remaining the very impressive Devlin was replaced by Mark Reynolds while Scott Wright replaced GMS. Michael Devlin looks like being a key man at the back for the Dons this season. 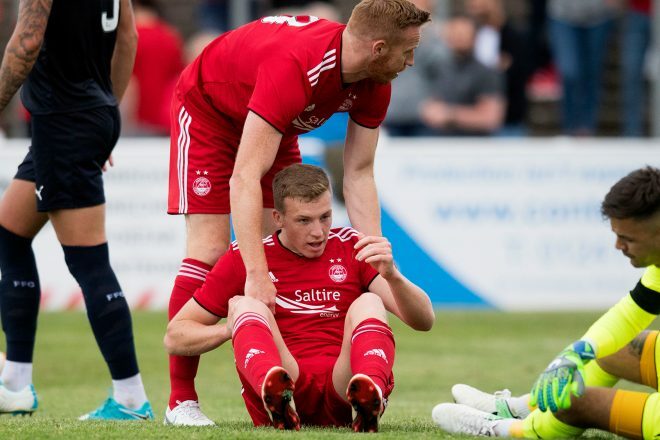 Cosgrove and Rooney swapped places on 83 minutes then with three minutes left Aberdeen finally broke the deadlock. Wright slipped the ball wide for Andy Considine to play first time into the middle where the inrushing Lewis Ferguson slid in to net from close range. A first goal for his new club for the former Hamilton man. A good work out for both sides with the Dons just about deserving of their victory over a Falkirk side who will hope to be very competitive in the Championship over the coming season. Aberdeen – Lewis, Logan, Shinnie (C), Considine, McKenna, Gleeson (Ferguson 70), McGinn (F Ross 70), Mackay-Steven (Wright 77), Cosgrove (Rooney 83), May (Forrester 45), Devlin (Reynolds 77). Unused substitutes – Rogers (GK), Harrington, S Ross, Campbell, Anderson. Falkirk – Fasan (Mitchell 45), McGhee, Brough (Trialist 45), Harrison (Muirhead 45), Dallison (C), Paton (Trialist 72), Robson, Sammut (Kidd 45), Turner (O’Hara 62), Petravicius (McKee 62), Froxylias (Trialist 45). Referee – Nick Walsh; Assistants – Stuart Stevenson and Calum Spence.